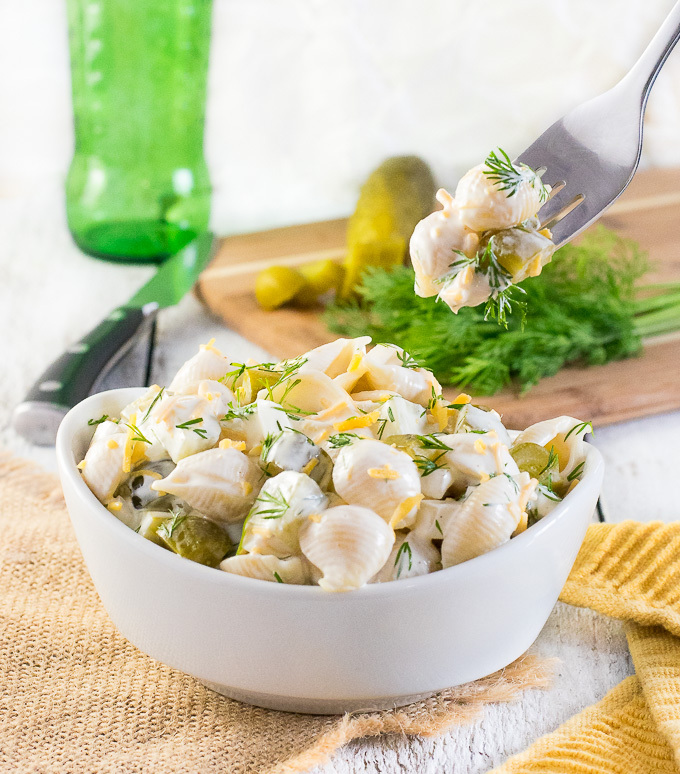 This creamy Dill Pickle Pasta Salad is infused with the bright and tangy flavor of crunchy pickles and fresh dill. Pickle lovers, this pasta salad is your dream come true! I can be a tad obsessive at times. When I discover something I am interested in I dive into it head first, researching every possible angle to learn everything I can about it. I guess I am a bit of a control freak because I don’t trust any one person to just give me all of the info, I insist on researching everything for myself to form my own conclusions. Well, I spent this weekend totally consumed by my next big adventure. I decided to plan a solo backpacking hunt in Wyoming for antelope this fall. Any dedicated readers may recall last fall I completed a 30-mile backpacking trek through Death Valley. I wanted to do another similar trip in 2017, so when I came up with the idea to combine my love for hiking with my passion for hunting, I was instantly stoked! Unfortunately, this meant I did practically nothing for the past three days other than pouring over maps of Wyoming and soaking up every last bit of info on Wyoming’s Game and Fish Department’s website. Seriously hours. I even woke up at 4 a.m. Sunday morning to do more research. So if any of you lovely readers just so happen to own a large ranch in Wyoming… I’ll bring the Dill Pickle Pasta Salad! Luckily, despite the hours I spent drooling over my computer screen this weekend, I did find time to make a couple of batches of this Dill Pickle Pasta Salad, and HOLY COW where has this been my whole life?!? 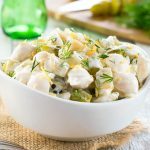 I would love to claim credit for this recipe, but I found this Dill Pickle Pasta Salad on Pinterest from SpendwithPennies.com. Seriously though, it is one of the best pasta salad’s I’ve ever eaten. If you love dill pickles, you need to try this recipe. 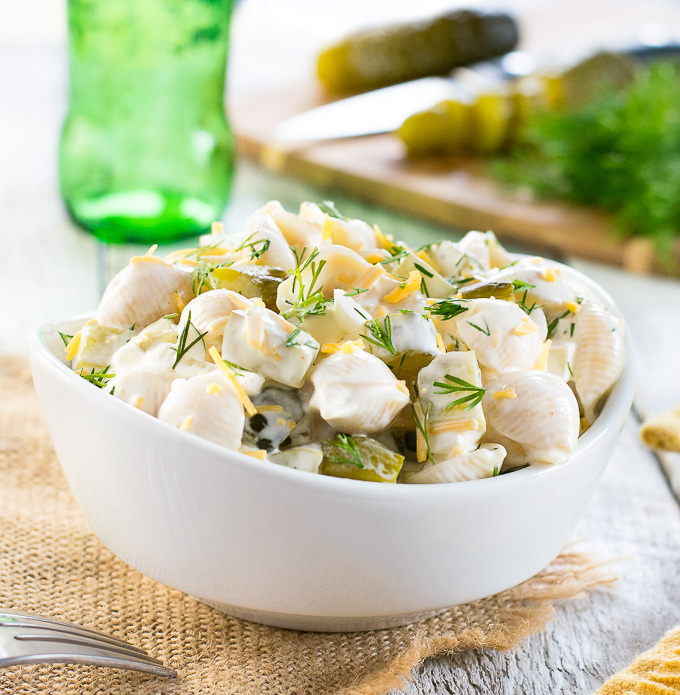 This Dill Pickle Pasta Salad is perfect to bring to summer potlucks. However, any mayo-based pasta salad needs to be kept cool to prevent food poisoning. Anytime it is unrefrigerated for 4+ hours you are playing Russian roulette with everyone’s safety. 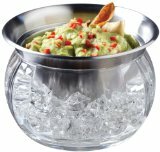 For this reason, I love these On-Ice Serving Bowlswhich will keep your Dill Pickle Pasta Salad at a safe serving temperature for hours! Cook the pasta in salted boiling water according to package instructions. 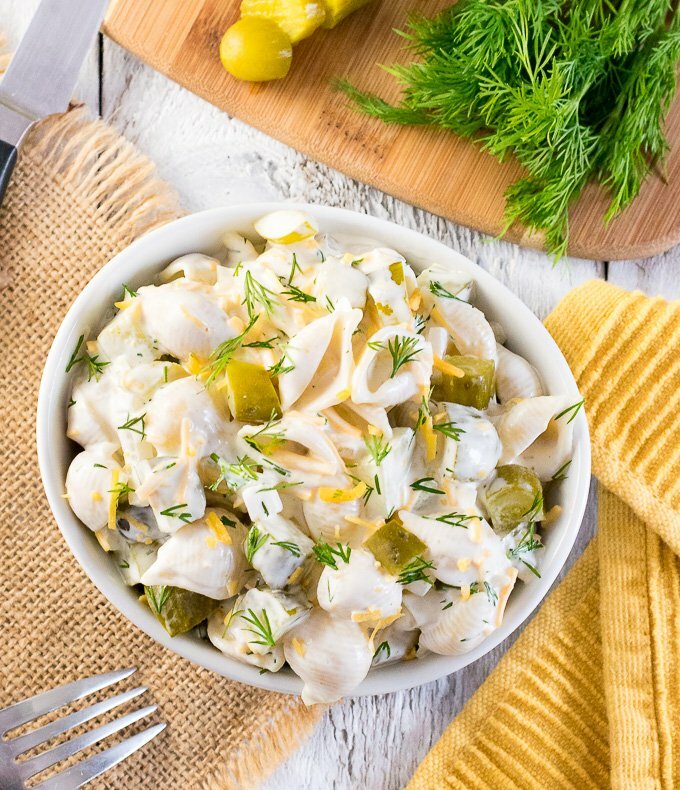 While pasta is cooking add chopped pickles, cheese, onion, and dill to a large bowl and set aside. Drain the cooked pasta from water and rinse under cold water. Add 1/2 cup pickle juice to the pasta and let sit for 5 minutes. Prepare the dressing by combining mayo, sour cream, pickle juice, and cayenne pepper in a separate dish. Whisk to combine. Drain pickle juice from the pasta and add pasta to the large bowl along with dressing. Toss to combine all ingredients. Add salt and pepper to taste. Serve immediately or refrigerate to allow flavors to meld. IF YOU LIKED THIS RECIPE you will love my BBQ Pasta Salad! Be sure to check it out. If you enjoyed reading my Dill Pickle Pasta Salad recipe then you should probably like me on Facebook and follow me on Pinterest too. That’s what I would do at least, because if you don’t get to know me but you still use my recipe it is kind of like taking candy from a stranger, and your mom taught you not to do that. Don’t disobey your mom, subscribe to Fox Valley Foodie today. YES…. This IS… THEE Best Pasta salad I’ve ever encountered… and I’m not even a pickle freak..
and THIS time I’m going to SHRED IT.. !!! Yum!! Thanks for sharing! if I wanted to make this spicy, what would you recommend? I would probably keep it simple and just add cayenne pepper or crushed red pepper flakes. I’ve made this a few times but I change a few things. I use purple onion, add two cans of tuna, and sometimes replace the pickles with pickles okra. And of course, tonnnnns of dill!! Love this! We make a big batch for lunches throughout the week! I just doubled this recipe and made it for a work pot luck today. It was a big hit. The only difference I made is that I *forgot* to drain the pickle juice after soaking the pasta in it. Guess what? It tasted great and everyone loved it. I won’t be draining the juice from now on.